Today's topic: What innovation could RPG groups benefit from most? Most readily, I think RPG groups could benefit from smart phone integration. Think about it. Most likely, everyone at your table is carrying one. There's probably a good chance they're already looking at it throughout the game session. I think there's an obvious opportunity for apps which make integrating them into the game a smooth endeavor. I realize that there are programs out there that would cover most of the functions I'm thinking about here, but something that made it more seamless, especially in the context of a group of people sitting around at a gaming table, would probably be very popular. As for innovations that aren't really prominent, I'd be delighted to see how the digital table top endeavor is coming along. 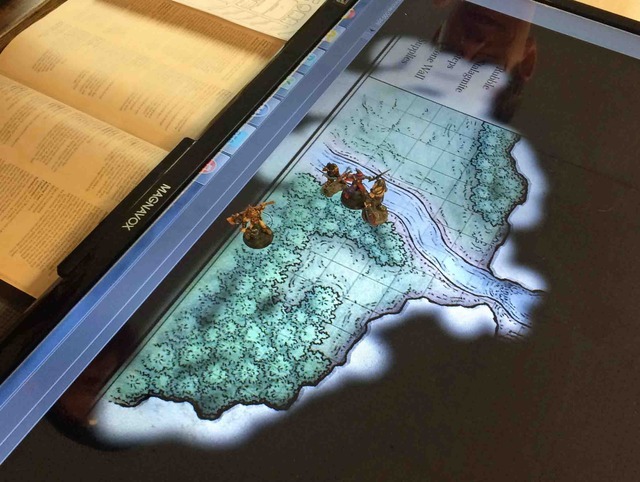 If you're not familiar with it, the idea was to take advantage of the boom in touch screen technology to create a digital, interactive table top display. Supposedly, this was something WotC was working on back in the days of D&D 4th edition, but seems to have abandoned the project for various reasons. Most likely cost; a quick google search shows digital table tops available, but with costs running in the $8-10k range. Yikes. The advantages of such tech are obvious: High quality visuals without having to buy printed maps all the time. (Generally) easy to interact with. Lots of possibilities for a variety of systems. Roll20 has been working on table/smart phone apps as well, so we're definitely getting closer to that end goal. The only thing I can see as being a problem with this approach is it takes a lot of effort to find or draw and then scale these maps to the right size for them to be useful. That's a lot of effort that can dealt with by drawing a map out on a Chessex grid or doing theater of the mind gameplay. There would need to be a big effort from the gaming community to collaborate and distribute maps designed to be used for digital play to make this an easier effort. Nice. I didn't know about the Roll20 apps. This sort of stuff is something I don't have good awareness of. I think the smart tables should have the ability to allow spontaneous, hand drawn maps to be made. I've seen digital dry erase boards at work, so I know the tech exists in some capacity. There are certainly setups one can buy that allow for drawing directly onto a display surface. SmartBoards come to mind, but they can cost upwards of $10K, depending on the model you purchase. There was a project that took a projector, but I imagine a TV could do the same, a Wiimote and an IR-emitting light pen that did the same thing for much less money. It might be worth looking at the project again, see what its status is. I think integrating smartphones so it's useful, productive, and not an opportunity to get distracted by other stuff on your phone is a serious challenge.